Windshield wipers are used to clean the windshield of a car so that the driver has an unobstructed view of the road. A typical wipe angle for a passenger car is about 67 degrees. The blades are 12-30 in (30-76 cm) long with lengths increasing in 2-in (5-cm) increments. The history of the windshield wiper began with the invention of the automobile. Most transportation vehicles did not have wipers. Horse-drawn carriages and trucks moved at slow speeds, and glass was not needed to protect the driver or passengers or to act as a windbreak. The first windshield wipers were brushes. Inventor J. H. Apjohn came up with a method of moving two brushes up and down on a vertical plate glass windshield in 1903. In the same year, Mary Anderson devised a swinging arm that swept rain off the windshield when the driver moved a lever located inside the car. Anderson patented her invention of the mechanical windshield wiper in 1905, and it became standard equipment by 1913. Electric motors were not used yet to power automobile essentials or accessories, and Anderson's device had a drawback. Without another power source, a driver had to use one hand to move the lever. The driver's other hand steered the car (with either a wheel or steering tiller) and worked the stick-mounted gear shift and brake grips standing on the floor of the car or outside the driver's side on the running board. Rubber strips replaced brushes as the cleaning tools on wipers in 1905. Unfortunately, the hazardous need for drivers to wipe windshields while driving was not eliminated until 1917. The solution was to use an electric motor to move a single wiper with a long rubber blade back and forth. Hawaiian dentist Dr. Ormand Wall invented the automatic wiper by placing an electric motor in the top center of the windshield so the wiper arced down over the hood of the car in a semi-circular or rainbow shape. Wipers were one of the first electrical devices in automobiles after the electric starter was developed in 1912. Most wipers on cars before 1930 were paired and hung down from the top of the windshield. They were moved to the base of the windshield as electrical systems became more complicated. Windshield washers were added to the wiper on/off levers, and these required spray nozzles in front of the windshield, a tank for washer fluid in the engine compartment, and electrical connections to coordinate these operations. In 1962, Bob Kearns invented the intermittent wiper with intervals and speeds that the driver could change. The advent of electronic systems with fuses and circuit breakers to operate, regulate, and coordinate electrical components expanded the possibilities for more diverse wipers. Wipers were added to headlights in the 1980s, requiring connections between the lighting and wiper systems. In the 1990s, microsensors were built into windshields to detect rain on the windshield, activate the wipers, and adjust speed and intermittent use for the amount of rain. The manufacturer purchases all of the parts from companies that specialize in fabricating parts from aluminum and steel, rubber blades, plastic bushings for the linkages, and the motors. Windshield wipers and windshield wiper systems (with motors) are different assemblies; some manufacturers make both, and others produce wipers only. Windshield wipers are designed and made to clear water from a windshield. Most cars have two wipers on the windshield, and they may have one on the rear window and one on each headlight. The wiper parts visible from outside the car are the rubber blade, the wiper arm holding the blade, a spring linkage, and parts of the wiper pivots. The wiper itself has up to six parts called pressure points or claws that are small arms under the wiper. The claws distribute pressure from the wiper along the back of the blade. This is described as a balance beam with a suspension system, where the wiper is the beam and the claws are the suspension components. The claws keep the blade flexed against the windshield to distribute even pressure to clean the glass all along the blade. More claws usually distribute the pressure better and are suited to large or highly curved windshields. Although the rubber is the familiar part of the blade, the blade actually includes a metal strip called a blade frame with a slot along the length of the frame and replacement holes in the frame. The replacement holes provide access for replacing the rubber blade with a refill. The blade on its aluminum frame can also be changed as a unit. The standard two windshield wipers are usually operated as a single-motor, tandem scheme with one wiper on the driver's side and one positioned near the middle of the windshield that moves across the passenger's view. The wipers are secured to pivots. A wiper and pivot are mounted on brackets at both ends of a long rod called the connecting link, and, as the force from the motor pushes on the driver's end of the connecting link, it in turn moves the other wiper. The connecting link is attached to another long rod called the drive link near the wiper motor. A slender spring linkage ties the pivot to the drive link to return the wiper to its resting or park position, hug the wiper close to the windshield, and keep it attached to the car if the links are damaged. Between the motor and the drive link, a linkage system consisting of a cam (another short rod) and pivot, a gear output shaft, and a worm gear controls the force of the motor delivered to the drive arm. The worm gear slows the speed of the motor while multiplying its torque (force). The gear allows a small motor to produce enough force to move the blades across the glass. This description is based on using a single motor to drive both wipers. If one motor powers each wiper, more links are needed to move the two wipers together in a so-called unitized motor system. ends of their movement, to resist the friction of the rubber against the glass, to resist the friction of the rubber on dirt on the glass, and to oppose wind pressure on the windshield. The tandem scheme is the most common because the blades produce overlapping cleared areas on the windshield with the greatest overlap in front of the driver. An opposed scheme with two blades begins with both blades on the windshield toward the sides of the car, and the blades overlap as they both pivot toward the center of the windshield. A single wiper that swings in an arc from the center of the windshield is also used. 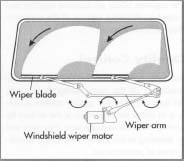 The single-arm controlled wiper is the most complex; as it sweeps over the glass, the wiper arm lengthens toward the car sides and retracts again as it points straight up at the middle of the windshield. Each of the two wipers in the tandem and opposed operating schemes and the one wiper in the single-wiper scheme make an arc with a single radius and so are called radial arm wipers. 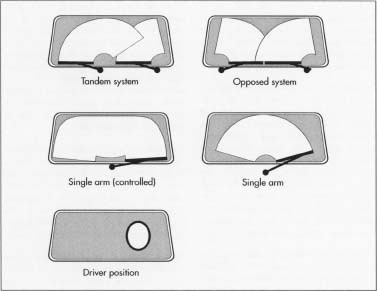 The single-arm-controlled wiper produces a multiple-radius arc. The electric motor, worm gear, gear shaft, cam, drive link, and pivots are built into the underside of the dash. The connecting link and wiper pivots are located below the windshield and behind the trim molding. Wipers called depressed wipers also rest behind the molding when they are not being used. Non-depressed wipers are above the windshield trim molding even at rest and are visible from outside the car and from the passenger compartment. In the passenger compartment, the wiper's on/off lever is usually attached to the steering column. When the wipers are turned on, an electronic circuit inside the wiper motor starts it. When the wipers are turned off the circuit stops the power to the wiper motor. Intermittent operation of the wipers is basically short on-and-off periods for the wiper motor that the circuit also regulates. Wiper manufacturers carry large stocks of materials provided by subcontractors. As the materials are received, the receiving inspectors confirm that the types and quantities of parts are correct, compile an inventory, and store the parts. The worker begins by putting together the pivot shaft for each wiper. The pivot shaft is made of a set of fasteners and spacers that hold the wiper arm securely while allowing it to pivot and sweep the design wipe angle. The shaft assembly includes the pivot shaft itself and (from the end near the small connecting link to the tip of the shaft) a rubber washer, metal washer, nut, nut cap, knurled driver, washer, and acorn nut. The knurled driver is a type of nut with ridges on the sides that grip any attachment. The wiper arm will sit on the knurled driver, which keeps it from shifting out of position on the shaft, and the washer and acorn nut hold the arm on the shaft. The pivot shaft is then attached to the small connecting link with a washer and spring clip. A pin on the pivot shaft can be inserted in any one of three pin positions when the shaft is attached to the link, depending on the design for the pivot and link. For a single-arm wiper scheme, a U-shaped, galvanized steel bracket is fixed to the small connecting link on the only pivot shaft with two shaft screws. The other end of the bracket will be attached to the drive link later. For a scheme with two wipers, the small connecting link for the wiper on the passenger's side is joined with a bracket to the end of the longer connecting link with shaft screws. Similarly, a bracket is put on the small connecting link for the driver's side wiper, and it is attached to the opposite end of the longer connecting link. Later, this end will also be attached to the drive link. The drive link will be attached to the motor in the next step. The motor with the worm gear reduction and other linkage is a stock item provided by a vendor, and the wiper system manufacturer does not make any changes to it. The drive link must be secured precisely on the cam (drive arm) on the end of the gear shaft so the wiper will sweep correctly but also so it can be parked in the right position under the car molding. The connection between the cam and the drive link will be fixed by using another bracket called the mirror bracket. the drive link to the motor. The bracket is put on the drive link with a set of screws. The bracket is then attached to the cam. With the angle established, the cam is checked for fit with the drive shaft. Spacer washers are added (if needed) between the cam and drive shaft, and the two are connected with a set of motor nuts and screws. For a single-wiper scheme, the bracket with the single small link and pivot is screwed on the drive link. For a scheme with two wipers, the bracket on the end of the long connecting link that also supports the driver's side pivot and small connecting link is fastened to the drive link. In the final steps in assembling the windshield wiper system, linkages made of springs are added to connect each pivot shaft to the drive link. The wiper arms and blades are connected to the pivots. The starter on the motor is also moved into the park position, and the wipers are placed in their park positions. If the customer is purchasing windshield wiper systems, accessories may be included. A system of washers with water bottles, tubing, and controls for the dash is the most common accessory set. A wiring harness with the washer controls and the other electrical connections for the wipers is provided with the motor. The completed windshield wipers are given a final quality control inspection as described below and transferred to the packing area. Depending on the items ordered, each set consisting of wipers, a motor system, and accessories is boxed with operating, maintenance, and return information. The separate boxes are bundled together and packed in shipping cartons if the customer ordered several items. During assembly, the workers observe the conditions of the parts during their work, but their only specific quality control activity is to check the operation of the motors by turning them on to make sure they start and by listening to the sounds they make as indications of performance. The last inspection is performed when the assemblies are complete and before the wipers and systems are packed. The manufacturing director or final quality control inspectors look at the general appearance of the assemblies, confirm that the wipers have been sized and angled correctly for their sweep, and check that the assemblies are in the park position. The director or inspectors also check to see that the correct accessories are ready to be packed with the assemblies. Small quantities of steel and aluminum scraps from trimmings or rejected or damaged parts are collected in bins and sold to salvage dealers who, in turn, sell them to metal manufacturers who melt the scrap down for recycling. Packaging from received parts is also collected and recycled. As of 2002, windshield wipers and wiper systems are evolving because of changes in automobiles and other vehicles, technical improvements, and consumer demand. Wiper blades are as much as 30 in (76 cm) long, creating more resistance as they clean the windshield. Night-vision screens for windshields are in development, and these also increase resistance and change the dimensions needed for wipers. Blades are being improved with increasingly flexible rubber, so-called "boots" that fit around the blades to keep out ice and snow, and nonstick coatings on the squeegee edges of the blades to keep oil and wax from adhering and aging them. Motor systems are also being increased in voltage to power longer wipers and more accessories. Engineers are investigating fully automated systems that do not require any actions by drivers to start and stop wiper systems. Inventors expect the capabilities of the rain-detecting sensors available in the late 1990s to widen to prompt the wipers to clean dirty windshields with no rain, for example. Windshield wipers are among most reliable automotive devices—the design life of a wiper system is 1.5 million wipes. Billiet, Walter E., and Leslie F. Goings. Automotive Electrical Systems. Alsip, Illinois: American Technical Publishers, Inc., 1970. Clymer, Floyd. Those Wonderful Old Automobiles. New York: Bonanza Books, 1953. Day, John. The Bosch Book of The Motor-Car. New York: St. Martin's Press, 1976. Halderman, James D. Automotive Electrical and Electronic Systems. Englewood Cliffs, NJ: Prentice Hall, 1988. Setright, L. J. K., and Ian Ward, ed. Anatomy of the Automobile. New York: Crescent Books, 1977. The World of Automobiles: An Illustrated Encyclopedia of the Motor Car. Vol. 22. New York: Columbia House, 1974. Anco Web Page. December 2001. < http://www.federal-mogul.com/anco/wiper_anco.html >. Cleveland Ignition Co. Web Page. December 2001. < http://www.windshieldwipersystems.com >. Two new significant developments have taken place in the last 24 months. 1) Silicone rubber blades are now starting to gain acceptance with aftermarket customers. Natural rubber and synthetic rubber blades degrade overtime from constant exposure to harmful UV sun rays and ozone. They also can not take the extreme temperatures blades see. Silicone on the other hand has excellent resistance to UV sun rays, ozone and will remain flexible at temperatures between -60F & 400F. The makers of Silblade and Flexblade are so confident of their patented silicone rubber formula coated with a Teflon coating that they warranty their blade for 5 years! 2) Wiper blade frames are moving from a traditonal metal claw to a one piece curved plastic molded frame. Some refer to it as a beem blade. This is revolutionizing the industry. This one piece frame works great in snow and ice.